Eureka, I decided to extend the series about wild bugs because I have a lot of new pictures and did some further streaking. A short summary about the previous plates seemed to be very difficult and that’s why I went for the continuation. What happened before? All begun with some souring bugs I had. I plated some of them on Sabouraud agar plates and had a look at the different colonies there were. Some of the bugs came from bottles like 3 Fonteinen Geuze, Girardin, Wyeast’s Roeselare Blend and BFM. If you are new to this series, you could go through the previous posts first. What happened in the meantime? First of all some corrections and further information. I found out that I misspelled the name of the 3 Fonteinen Geuze. The correct form (as written on the bottle) is Geuze and not Gueuze. Both forms, Geuze and Gueuze seem to be correct. But I should use the name as it is written on the label… Another information is about the BFM brewery in Switzerland. Some of you might remember that I had a look at a beer which I made using some dregs of a BFM beer. What I could observe were a kind of Brettanomyces. One reason why I dared to identify these cells to be Brettanomyces was the information I got that BFM does not use any kind of Brettanomyces (the brewmaster told me that). This changed in the meantime. I got informed that BFM has a Brettanomyces “infection” in the brewery and that all the beers have a Brettanomyces character. I already suspected that because all of the beers I tried from the BFM brewery had a very distinct character. So far about further background information. I will try to make it as easy as possible to follow the different experimental stages and therefore split the different bugs between different posts. And there will be just beer related bugs, no kefir or kombucha bugs anymore. Another change I made is the size of the pictures. The next pictures will be in their original size to make it easier for you to follow my observations. One thing that I am still working on is to implement some sort of scale for the pictures to get an idea about the size of the individual cells. There are at least three different colonies on the plate (Fig 1). There are white circular colonies, off-white colonies (upper left part of plate) and very small colonies between the white circular colonies. The off-white colonies were already determined to be bacteria in a previous post. And I already had a look at the white colonies as well. This time I looked at the small colonies as well and there I could see some kind of circular bacteria (Fig 2). I had to use my oil immersion objective to see the bacteria and this makes it even more difficult to see anything. But there is something to see. There are some circular cells to see that form a kind of tetrad. J. Liddil describes the Pediococcus in “A Liddil Lambic Lession” to be a spherical and tetrad-forming bacteria. These description match the bacteria that are in Fig 2. So the small colonies on the plate in Fig 1 could be Pediococcus. I transferred a white colony from the plate in Fig 1 on a new plate and incubated it as well (Fig 3). The colonies that arose on the plate were white again. But the morphology was quite different to Saccharomyces. Colonies of Saccharomyces tend to have a bit of a glossy appearance and these colonies don’t. 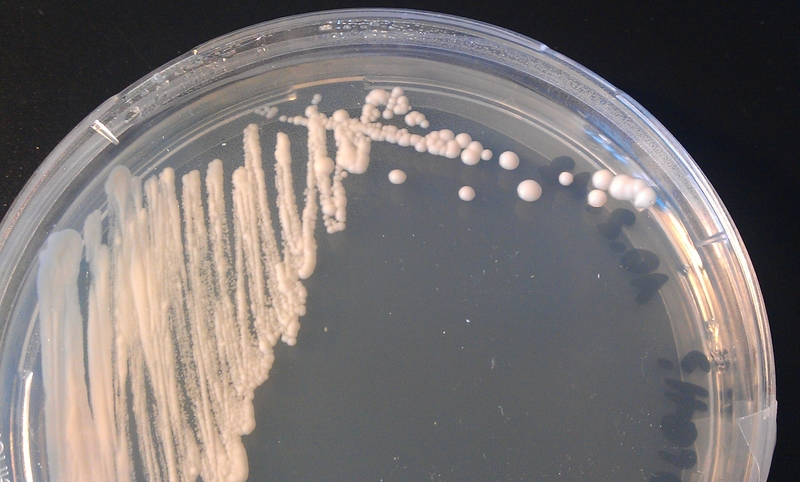 Further on, these colonies were whiter than typical Saccharomyces colonies. I have to mention that I am very proud of my striking technique to get such beautiful plates… Next step, microscopy. I took a colony and had a look at the cells. First of all, the cells have the size of typical yeast cells. But some of them look very different to the circular shape of Saccharomyces. Some cells look like brewer’s yeast, others don’t. I assume that the colonies on this plate are either not pure or the yeast in there has different morphological appearances. Well, I can’t tell what I got myself here again… Maybe some kind of wild yeast? 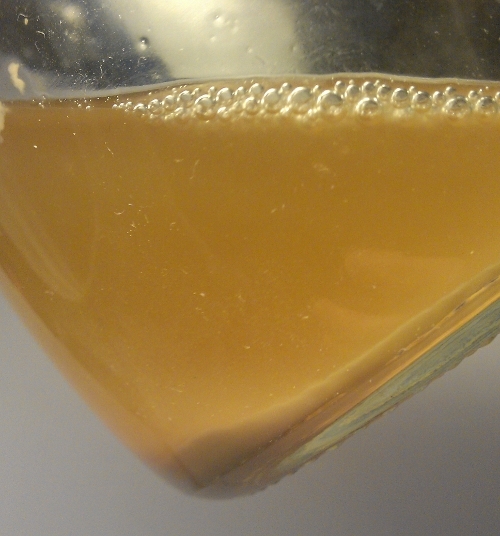 Could be Brettanomyces or Kloeckera or…. Comparing the cells with other pictures from the web is quite difficult since the available pictures are very limited. That’s one of my goals to build up a kind of picture library of different wild bugs. But that will take me some time because I have to get some experience first with all the different souring bacteria and yeasts. I already started a fermentation test with the yeasts from Fig 4 to see what the starter will taste like. I will promise to report about the fermentation tests. Well,that’s all I planned to do with the bugs from the 3 Fonteinen Geuze so far until the results from the fermentation test. The next posts will be about the Girardin Gueuze and Wyeast’s Roeselare Blend. Further on, I planned to do my All-Brett brew the next weekend and will ferment it with Wyeast’s Brettanomyces lambicus and Brettanomyces bruxellensis. And there are still some fresh Sabouraud plates waiting for both Brettanomyces strains… Further experiments with both Brettanomyces strains are planned as well to get to know these strains a bit. Stay tuned! Eureka, I finally did it. After several hours of tasting, collecting data and other stuff, I am now able to post the first results of my wheat yeast comparison experiment. The experimental design is already posted in a previous post. Todays post is all about yeast performance, the tasting of the different beers will follow in the second part. I split the results in two parts to make it easier to read and because the tasting part is not yet written. Lets begin. 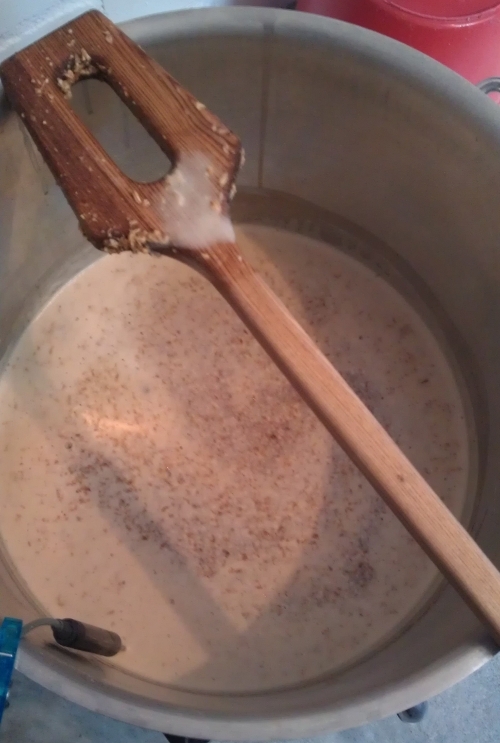 As the Cooper’s yeast showed molds in the starter, the yeast was excluded from the experiment. The original gravities and the efficiencies (Sudhausausbeute) of the three different batches were quite similar. The used brewing technique seemed to be more or less consistent over three batches. I already observed a higher efficiency for higher batch sizes in other brews before. The terminal gravities were measured by a refractometer and transformed into a terminal gravity [°P] by use of a table. The apparent attenuations are shown in Fig 1. The uncertainty was calculated by the standard deviation and shows the region of the mean value with a certainty of 95% (equals two standard deviations). Fig 1: Apparent attenuation levels of different wheat yeast strains compared with stated attenuations of the yeast suppliers. n = 2 (except for the #3942 (n=1) and #3068 (n=3)). No numerical attenuation levels stated for WB-06, Danstar Munich and Burgdorfer Weizen. As shown in Fig 1, all the yeasts reached the apparent attenuation as specified by the manufacturers. The measured apparent attenuations seemed to be slightly higher than the specified values. Further information about the #3068 and the huge error bar follow below. The measurement of the #1010 American Ale and Burgdorfer Weizen were the same in both fermenters thus no error bar. The #3942 Belgian Ale yeast fermented just one batch, thus n=1 and no error bar as well. The highest attenuative yeast was the dried yeast WB-06, the lowest the isolated Burgdorfer wheat yeast from a bottle. It can be concluded that a wheat yeast has an apparent attenuation of about 75%. The attenuation levels of the #3068 Weihenstephan in the three different batches compared with the specified attenuation level from Wyeast is shown in Fig 2. The #3068 was used as a reference yeast strain in all the three batches. It can be shown that the #3068 in the first and second batch differ significantly. The attenuation in the second and third batch were quite similar. To compare the attenuation level of the #3068 with the other yeasts, the author used the average of the three batches and used the standard deviation for the calculation of the error bars. This is the reason for the big error bar in Fig 1 for the #3068 Weihenstephan yeast. One explanation could be that the fermentation was not over yet and the terminal gravity was not at its lowest point. Another, the source of the yeast. The yeast for the first batch was isolated from a previous batch of wheat beer. The yeast for the second batch was used from the first one, and for the third one from the second. One goal of the experiment was to find out, if the #3068 Weihenstephan is indeed the same yeast as the dried WB-06. Comparing the apparent attenuation of the #3068 and the WB-06 does not lead to a clear answer: Comparing the #3068 from the first batch with the WB-06 shows no difference in attenuation between the two yeasts. Comparing the second, third batch fermented with the #3068 and the WB-06 shows a clear difference. Comparing the specified attenuation of the #3068 with the WB-06 shows a clear difference as well. The manufacturer of the WB-06 specifies the WB-06 yeast to be highly attenuative. The attenuation of Wyeast’s #3068 is stated to be between 73- 77%. Assumed that a high attenuation is in the region of 85%, this would mean, that the attenuation levels of the two yeasts differ significantly. The author concludes, through the comparison of the different average-attenuation levels of the two yeasts, that the attenuation level of #3068 Weihenstephan and WB-06 differ significantly. To summarize, the apparent attenuations of the yeasts tended to be higher than the specified values. The WB-06 yeast reached the highest attenuation, the isolated Burgdorfer wheat yeast the lowest. A wheat yeasts attenuates in the region of 75%. The #3068 attenuated differently in the three batches. The #3068 Weihenstephan and the WB-06 had not the same apparent attenuation levels. Thus it is quite probable that the two yeast strains are indeed not the same. That’s all about the wheat yeast performance results. 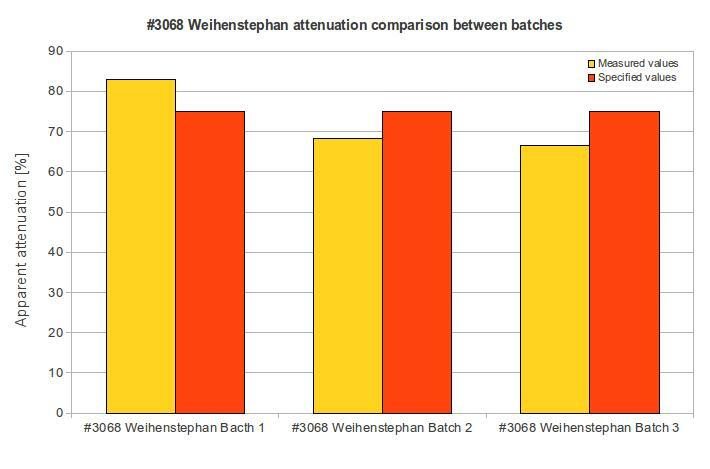 I am a bit surprised about the different attenuation levels of the WB-06 and the #3068 Weihenstephan strain. Maybe the drying process of the yeast could influence the attenuation level in some way? The final word will be spoken after comparing the two beers in a tasting. As already mentioned, the tasting results will be posted in a different post soon. I still figure out how to present the different results in a comfortable way. Stay tuned. Eureka, we travel back again for a past recipe. The following recipe is an attempt to clone the legendary Orval. I did a lot of research to get as many information as possible about the abbey and the brewing process itself. Then blended all the information into a recipe and tweaked it a bit to fit my system and ingredients. I could easily write a whole post about how I came up with the recipe but this would be very boring I guess. Orval is quite different to the other Trappist brews. I assume that Orval is the only Trappist beer made with dry hopping and Brettanomyces. Lets get into the recipe. 05/17/2011: Brew day. Mashed in at 66°C and iodine test was negative after resting for one hour. 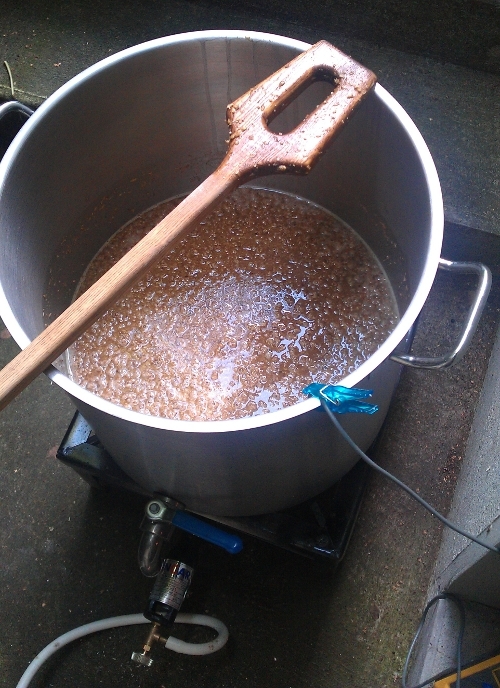 Then sparged and boiled the wort following the hop additions. Then cooled the wort down to 20°C and pitched Wyeast’s #3522 Belgian Ardennes. I made a starter of the #3522 a few days before. 05/24/2011: Racked into secondary fermentation vessel. Gravity: 9°P. Added dregs of two Orval bottles and the Styrian Goldings for dry hopping. 06/24/2011: Bottled the beer with fresh yeast and some table sugar in 0.75 L champagne bottles. Gravity: 5.2°P. The bottles still mature at around 15°C (59°F). 08/23/2011: First tasting. Beer is nearly two month now. Aroma: Pepper notes. Aroma reminds my of some sort of candy. Overall Impression: A very nice brew already. Quite solid! I would definitely drink a second one. The beer still has the character of the Belgian yeast strain (Wyeast’s #3522 Belgian Ardennes) and the hops are still detectable. Typical taste for a fresh beer. But the taste is very different compared to a fresh Orval beer. 12/01/2012: Second tasting. The beer is now nearly seven month old. Aroma: Hoppy smell (grass note), not funky, multi vitamin fruit juice aroma (pineapple). Appearance: Orange, nice carbonation visible, 2 finger off-white head, very long lasting. A bit hazy from the yeast sediment in the bottle. Flavor: Hint of bitterness, notes of oranges, light grassy note as well. No pepper notes anymore. Quite dry. Mouthfeel: Light- medium body, average carbonation, pretty dry finish, and hints of bitterness in the aftertaste. Eureka, Ab aedificandam abbatiam adiuvi (I helped to build up an abbey). 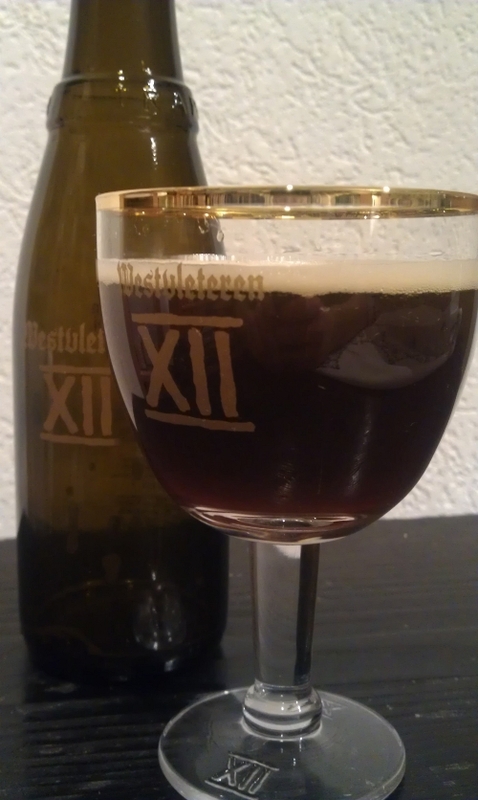 Today some tasting notes about the Westvleteren 12. 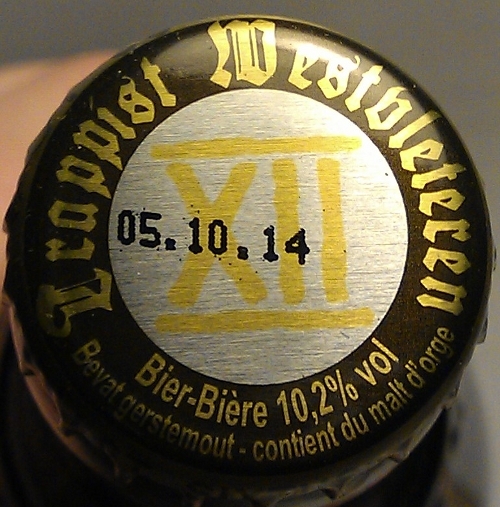 I guess I do not have to explain what kind of deal the Westvleteren 12 is, right? If you have no idea what I am talking about, some people say that this beer is the best on the planet. Is the Westvleteren really the best beer in the world? Lets find out. How do I got myself some of these beers? Well, I got the chance to buy an awful looking brick from the brewery a few weeks ago. It comes with six bottles of the Westvleteren 12 and two glasses. 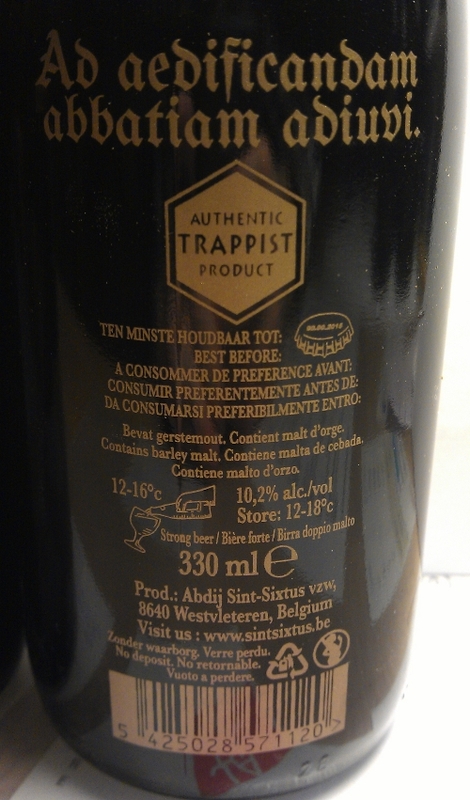 First of all, I am quite disappointed about the visual appearance of the package itself… And there aren’t even the real Westvleteren glasses included! There are two glasses, sort of small goblets, with some imprints: Westvleteren XII and “Ab aedificandam abbatiam adiuvi“. The same is written on the bottles. And on the packages it says: “This unique Trappistbeer, brewed and bottled in the Sint-Sixtusabbey at Westvleteren, is offered to you in this exclusive and limited giftbox. This exceptional set enables you to contribute directly to the extensive renovation of the monastery. Cheers!”. The Westvleteren 12 comes in 330 mL bottles and 10.2 ABV. All in all, the appearance is very poor and kind of cheap in my opinion. But enough with the evaluation of the package. Aroma: Sweet, raisin notes, caramel, clove and reminds me a bit of almond paste (marzipan). The aroma is quite nice. But not overwhelming as well. Appearance: Clear with some particles (yeast in the bottle), brown with a hint of red, light <1 finger tan head, some bubbles visible. Looks like a typical quadrupel. Flavor: Caramel notes, marzipan again, some dark fruits, molasses, notes of dark sugar. The candy syrup they use is very easy detectable. Some bitterness is detectable as well. Overall Impression: I have to say, this was one of the most difficult tastings ever. Not because of the complexity of the beer but because of all the expectations I had for this particular brew. And I have to mention something else before getting into the evaluation. According to the cap, the beer is best before the 5th of October in 2014. And I conjecture that the beer I tasted was bottled on the 5th of October in 2011. So the beer was nearly four-month old and therefore pretty fresh. Lets go into the evaluation. Well, the beer has some interesting notes indeed. I can’t remember a beer where I tasted marzipan before. But I am not convinced about this beer. There are even some notes I really do not like in such a beer like the detectable bitterness and the alcohol notes. And I would not even drink a second one of it! Really, it was not that interesting after all. Some of the flavors were not yet fully developed. I would give this beer a rating of about 80/100. I even gave the Abt 12 from the St. Bernardus brewery (some say it is a Westvleteren 12 clone) a rating of 90, and this was a really interesting brew indeed. But I can’t remember how old the Abt 12 was. Eureka, another post about dregs and a really awesome beer. Since September 2011, Bern has a new local beer pub for beer geeks like me. The bar is run by the legendary Erzbierschof and he has a huge variety of different beers in stock. I have to mention that there was no beer-geek-pub in Switzerland before. My first visit was in mid September and had a bunch of beers like Anchor Steam’s Porter, Southern Tier’s Pumpking and a 3 Fonteinen Oude Gueuze. I have to say, I was quite speechless after the first sip of this particular Gueuze and had a big smile in my face (like the Cheshire Cat…) This beer is still one of my favorites. I got myself another bottle in December and tried it on the 14th of January 2012. Still the same awesome beer. Aroma: Could notice some hints of apple, slight vinegar note, horse placket, very funky. I just love the smell. 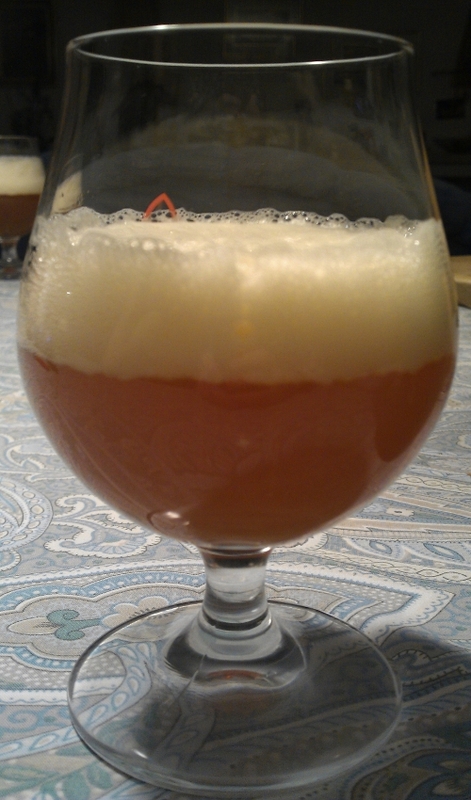 Appearance: Yellow, lightly hazy, some carbonation visible, light white head. Flavor: There are a lot of different flavors. I can pick up apple notes and maybe some apricots? The beer is pretty dry and lightly acidic. Mouthfeel: light body, medium carbonation, pretty dry finish. Overall Impression: Well, another awesome beer. Very nice aroma. And there are a lot of different flavors on the palate. Just a bit acidic and pretty dry finish. I guess this could be a good beer to get into sour beers as the sourness is not too overpowering in my opinion. Would I drink another one? Definitely! Get yourself a bottle if you can. 01/15/2012: The cultivation begins. Dumped the dregs into a sterile 100 mL starter (10°P) made with dried malt extract and some yeast nutrients. 01/28/2012: There is a sediment in the bottle. The starter has a very strong acidic aroma, smells like vinegar but in a good way. The liquid was quite sticky and thick. This might be what brewers call ropy or sick. Pediococcus produces a carbohydrate compound that leads to an elastic consistency. The consistency should get back normal in a few months [Cilurzo, p10]. I guess this could prove the existence of Pediococcus in the dregs? 01/30/2012: Plated the bugs from the sediment on some agar plates. 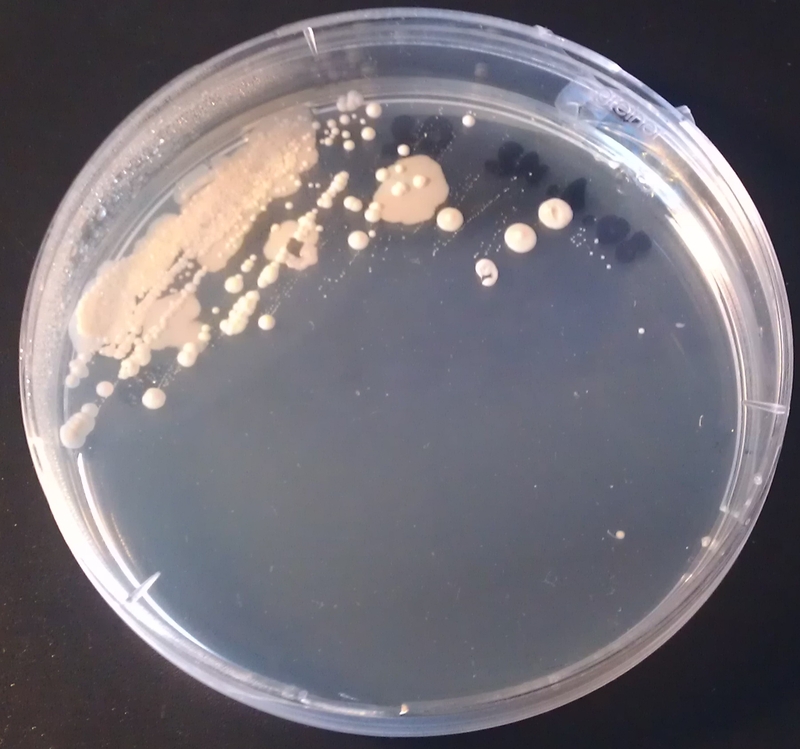 02/02/2012: Could observe just one kind of colony morphology on the Sabouraud agar plates. And it turned out to be a kind of bacteria, not yeasts. It might have been Acetobacter. 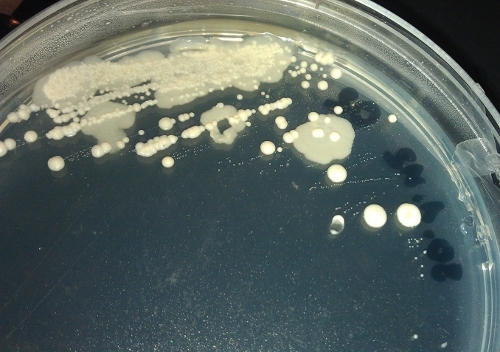 02/15/2012: Further colonies are visible on the agar plate. Some colonies are very small (< 1 mm diameter) and some look very similar to yeast colonies (white and round). First of all, I have to apologize because I still do not know the exact magnification of the picture as my camera uses a different kind of magnification. I normally look at the cells with a 800x magnification and take a picture. But the magnification in the picture is lower than 800x. I am still working on a solution to get the exact magnification. Lets get back to the picture. 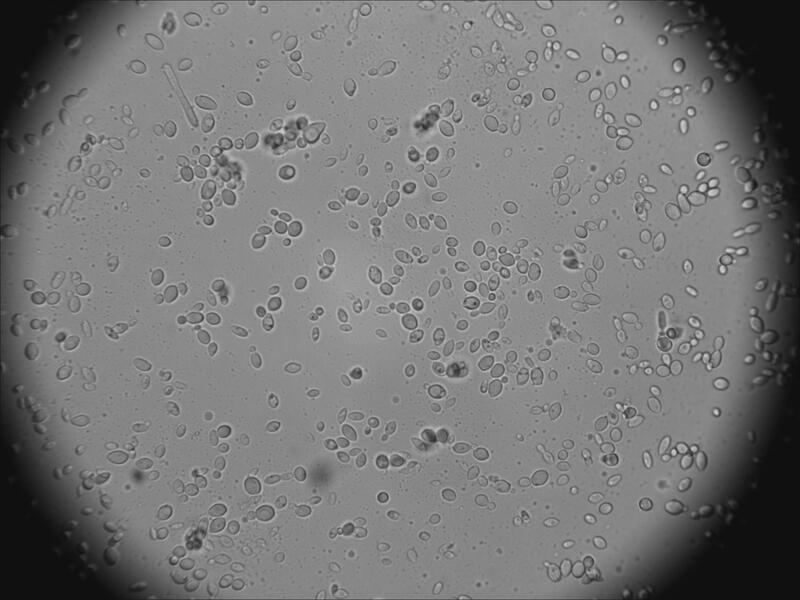 The cells are again a kind of yeast due to their size. But they look very different to normal Saccharomyces cerevisiae. 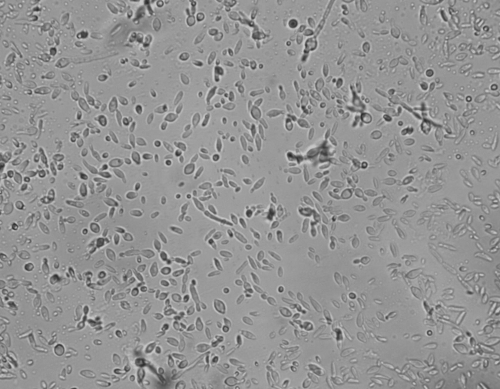 S. cerevisiae are oval shaped cells in general. But here we have some kind of elongated cells. And I have no idea again what I got myself here… It could be a kind of Brettanomyces or other yeasts I guess. One fact that points to Brettanomyces is the time it took the microorganisms to form colonies. Brettanomyces is known to be a slow grower. I learned from this experiment that it is possible to harvest some bugs from dregs of a sour beer. I have a very strong feeling that the bugs I have here are a kind of Brettanomyces. If that would be true, then using Sabouraud agar and some patience is good enough to get some Brettanomyces out of dregs. Now I wait until the small colonies (the very small ones with a diameter < 1 mm) form bigger colonies and do another microscopy analysis. As already mentioned in the last post in the pentade about agar plates, I will publish a summary post about the experiments and include some new results as well (like the ones above). But please be patient, my time is very limited at the moment. Anyway, I will try to publish at least one post a week in the future. Stay tuned! Eureka, time for another recipe. Brewed this one in 2011 to try Simcoe hops for the first time. To do so, I planned a very easy English Pale Ale recipe and threw some Simcoe hops in there. And I wanted to try first wort hopping as I read that it should increase the hop aroma. So I went for it. By the way, APA stands for American Pale Ale. 08/18/2011: Brew day. Iodine test was positive after resting for one hour. This never happened to me before which such a malt grist. I then found out that my thermometer was broken and the temperature was too low for the whole hour. So I had to rest for another additional 30 min @64°C (147°F). All the rest went according to the protocol. Bottled 2 L of wort before chilling for priming. The original gravity and volume were spot on as calculated. 08/25/2011: Racked the beer in another fermenter and added the 100 g Simcoe hops for dry hopping. Aroma: Still very hoppy after two months. Pine and citrus notes. Nothing else to smell. Very clean aroma profile. Flavor: Citrus notes, really bitter, no malt character. Pretty clean and dry. Mouthfeel: Light- medium body, average carbonation, medium lasting bitter aftertaste. Overall Impression: This was the first time I used Wyeast’s #1056 American Ale yeast strain. And I already love its very clean character. The beer is very easy drinkable although the bitterness is very overwhelming. No off flavors and still fresh. Would I drink another one? Yes! But there is something off here: the bitterness. I planned it to be around 34 IBU and this would be some bitterness but not as overpowering as it is. This brew is more an IPA than APA. What happened? First, one problem could be the calculation of the first wort hop. I just calculated it as the hops would have been boiled for 60 min. Maybe the dry hops could have increased the bitterness as well. I will brew this batch for a second time in 2012 but I don’t know yet whether I change the first wort hopping or the amount of dry hops. I posted about my results (higher bitterness than expected) in a forum and my helpers mentioned that dry hopping might increase the bitterness as well, not by increasing the IBU per se but by increasing some other compounds that lead to a higher perceived bitterness. Someone suggested to dump some hops in a bland liquor and try to taste the bitterness after some days. And I am definitely going to do that. To summarize, I really like Simoce hops and the #1056 American Ale yeast. The reason why I did this kind of batch was to create a recipe where I can try different hops and get to know the different hop characters. And I guess that an APA recipe would be the best way to do so. Eureka, and another recipe from the early days. Today, the third batch of wheat beer for the wheat yeast experiment. There was just the Wyeast’s #3942 Belgian Wheat strain left to be tested. The rest of the batch went to my sister’s Matura party (certificate to begin studies at an University). The name Mulus is a description for a student who just got graduated but did not start at the University yet. 05/21/2011: Brew day. Brewed a Irish Stout in parallel to this batch. I guess this was one of my most favorite brew days ever. Because some of my sister’s friends helped me to brew. So I let them stir the mash the whole time… No, I am just kidding. But all went well, even the lautering process. Perfect. And I really enjoy talking about the whole brewing process in a very chemical way… Well, isn’t the whole mashing and resting process a biochemistry experiment? That was enough science and fun for this post. I split the batch into three fermenters and let the #3068 and #3942 do their job. 06/03/2011: Bottled the beers with sugar and let them carbonate for nearly one week. And off they went into the refrigerator. The tasting notes of the brews can be found in the wheat yeast comparison experiment. And after seven batches (!) of wheat beer in 2011, with a total of 121 L (32 gal), I am a bit bored of wheat beers. And I still have some bottles of wheat beer in the refrigerator… But I will proceed on brewing wheat beers. One reason, I really enjoy a wheat beer in the summer especially a dark one, and second, I have six different wheat yeasts in my yeast library waiting for a next batch.